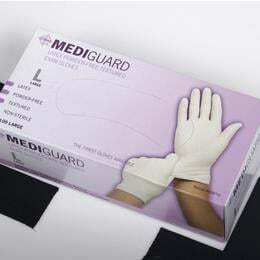 Mediguard Pf Latex Textured Exam Gloves: Mediguard Pf Latex Gloves Have High Elasticity And Provide Excellent Tactile Sensitivity. They Are Ideal For Use In Procedures That Require Greater Dexterity And They Are Textured To Help Ensure A Secure Grip. Medium.